The Omni Tanker AMSIIntern team from L to R: Garth Pearce, Supervisor UNSW Luke Djukic, Chief Technical Officer, Omni Tankers and Thinu Herath. Australia’s leading national, all-discipline, multi-sector postgraduate internship program, AMSIIntern, is using research and innovation to transform NSW industry. From big business to SMEs, access to specialised research expertise is giving local companies, such as Omni Tanker Pty Ltd the leading edge. Discover how AMSIIntern helped the chemical tanker manufacturers find their perfect partner and engineer their way into the European market. With engagement currently sitting well below the OECD average at only four per cent compared with New Zealand’s 20 per cent, Australia must turn the tide on research-industry collaboration or risk its place as a global innovator. Leading the charge at the frontline of this national challenge, AMSIIntern is providing a platform to give industry such as Omni Tanker access to the skills needed to deliver real business solutions. In turn exposure to the challenges and rewards of industry research ensures emerging researchers such as Thinu Herath are job ready. 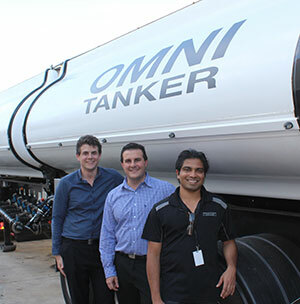 Herath, a former University of New South Wales PhD student, recently completed a project with chemical road tanker leaders, Omni Tanker, using his specialist engineering skills to design a European standard compliant tank. As well its structural design, he developed and tested the 4000L tank’s fire protection system. Now employed by the company, he was invited to travel to Germany with their Chief Technical Officer, Luke Djukic where the prototype passed fire testing as part of the standards approval process. This is only one of a growing number of success stories. The program’s access to academic networks across 30 universities nationally and multi-sector reach is currently helping transform research engagement within defence, meteorology, telecommunications, environmental conservation, banking and finance, medical research and local government. In a world transfixed by the possibilities of technology, automation and big data, industry demand for research only continues to climb. Now as Australia continues to push a post-resources innovation agenda, strengthened research-industry pathways are critical to enable industry – from big business to SMEs and start ups# – flourish in the global marketplace. AMSIIntern offers a tailored, risk-free opportunity to tap into the research pipeline and access the expertise needed to drive growth and take Australian business to the next level. Integration of industry internship pathways into the PhD process, takes postgraduates beyond the scope of their academic studies giving them and Australian business the leading edge and the knowledge to transform the future. Laura Watson is the Media and Communications Officer, AMSIIntern.